Our pots of Alpro Cherry & Blueberry have a subtle sweetness with a touch of tartness that blends perfectly with our smooth, creamy plant-based alternative to yogurt. A source of protein, calcium and vitamins B2, B12 and D. Low in saturated fat and every spoonful filled with fruity joy. 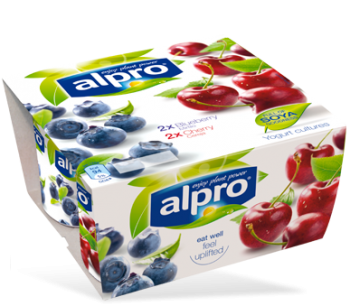 The Alpro Cherry & Blueberry alternative to yogurt can be sold separately to extend your range and boost your profits.